This hardcover published by IDW includes the original short story scribed by Joe Hill, and its comic book adaptation by writer Jason Ciramella and artist Vic Malhotra. Both are quality examples of storytelling in their respective mediums; but thanks to the pairing of both the original prose story and its subsequent reworking into a new form, the collection also offers fascinating insight into the adaptation process. Ciramella and Malhorta make slight alterations to Hill’s narrative, but it’s fundamentally the same: Private Mallory Grennan has returned home from Abu Ghraib prison, Iraq, determined to start a new life, away from its horrors, hoping she can somehow extinguish her guilt. Abu Ghraib is infamous for its violation of human rights; prisoners there were tortured, sodomized and sexually abused by military police personnel of the United States Army and the Central Intelligence Agency. Grennan participated in these acts; she drew neither pleasure, nor displeasure from her actions. It was her job, it was what she signed up for, and ultimately, when you’re marooned in that world for an elongated period, the concepts of right and wrong dissipate into simply what is. This was her reality, and Grennan did what she had to. Back home now, Grennan hasn’t been able able to forget, nor forgive, herself for her brutal exploits. And when mysterious envelopes containing blank sheets of paper stained with a thumbprint begin showing up in her mail, at her door, even in her home, she knows it’s her past come back to haunt her – – but Grennan’s got a lot of potential ghosts. Hill’s short story paints a bleaker picture of Grennan than Ciramella and Malhorta. She’s harsher, more despicable, and more unlikable than her comic book equivalent. Both stories focus on the effects war has on people; the psychological, PTSD trauma that’s whispered about, but rarely properly spotlighted, and how that can flare up and hinder ex-soldier’s reintegration into society. THUMBPRINT is a psychological thriller with a menacing core. The comic plays into the tropes of the genre more than the short story, purely for conventional storytelling reasons. Hill can afford a nebulous ending, whereas perhaps the graphic storytelling form necessitates a conclusive finale. I preferred Hill’s, but having read the graphic adaptation first, Ciramella and Malhorta’s version is equally satisfying in its own right. Ciramella adeptly deconstructs Hill’s story into a strong script, which Malhorta illustrates with great aplomb. His art style, slightly sketchy with thick inks, is suitably gritty. 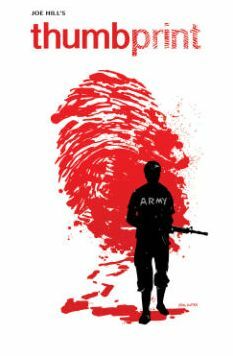 THUMBPRINT, in both its incarnations, is a powerful character study. It’s a short read, but of the highest quality; another reminder that I need to delve into Hill’s longer prose as soon as possible. The comic and prose story have their own merits, and presented together in one volume, this is a fantastic package for any reader looking for a quick, powerful story about war and its impact.